Cumin lamb, braised bok choy with tofu skin and Guandong-style boneless duck at Peter Chang's China Grill. I just got a disturbing annual report from WordPress that says I’ve managed to blog all of seven times in the past year. Here’s my 8th attempt at a post, staring down the midnight, here comes ominous Mayan 2012 deadline. 2011, with a turbulent pregnancy, new motherhood and a slow computer clogged with my huge, disorganized audio, photo and video files, somehow got away from me. I commit to do better in 2012. I’ll make baby Theo‘s afternoon naps my new blogging time. Chang’s is known for authenic, hot and numbing Sichuan fare. We’ve eaten there twice and particularly loved his eggplant dishes, spicy dan dan noodles and fragrant, Uighur-inspired cumin lamb. Dining at the restaurant this trip, we had eggplant deliciously dry-fried with no residual grease, like crisp French fries. The numbing Sichuan peppercorns atop make it too hot for some. We had our favorite tender cumin lamb. And I wanted to try a duck dish. The smoked duck at the neighboring table was temptingly served Beijing kaoya-style, but with fluffly baozi-style buns (think David Chang’s unctuous pork belly buns) instead of bland pancakes. 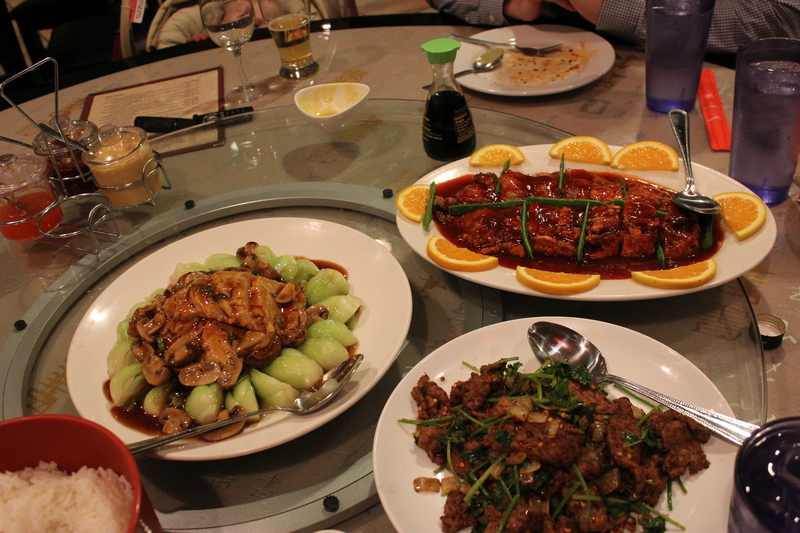 But the neighbors said to order sweet Guandong duck instead so we did. It had a pleasant, if unspectacular, sweet-and-sour sauce. The rectangles of fried duck were boneless, which made for smoother eating. And we started with Shanghai-style scallion pancakes, a nostalgic taste of China for me. 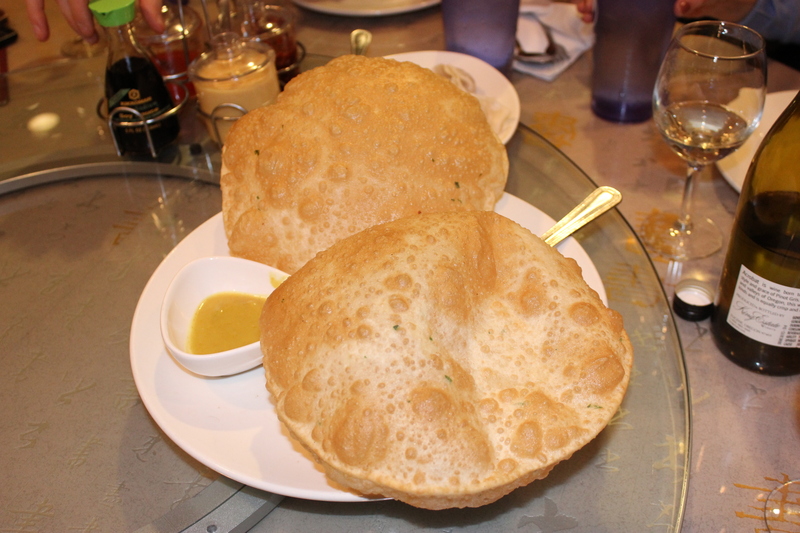 Except they were unusually puffed up like Indian pooris. I once made Eileen Yin-Fei Lo’s pancake recipe, with lard, but my technique needs perfecting. Here’s to making more Chinese scallion pancakes in the new year, as I post this just as the clock strikes midnight! Scallion pancakes puffed up like poori at Peter Chang's. Looks like Peter Chang is now expanding into my hometown of Richmond. Near Wal-Mart. Interesting, given the enthusiasm for the chain within China. Short Pump is pure suburban sprawl but urbanized live-work-shop-dine development to make it more palatable. They even have an REI store there now. But still it pulls folks away from less prosperous but more worthy downtown Richmond. We loved having breakfast at The Tavern! Were sorry when they closed it.